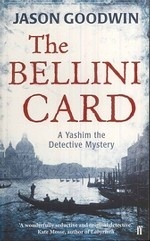 Аннотация к книге "The Bellini Card"
The third book in Jason Goodwin`s celebrated series takes Yashim from the winding alleyways of Istanbul to the decaying grandeur of Venice. Charged by the Sultan to find a stolen painting by Bellini, he enlists the help of his friend Palewski, the Polish Ambassador, and goes undercover. Venice in 1840 is a city of empty palazzos and silent canals, and Palewski starts to mingle with Venetian dealers - self-made men, faded aristocrats and the hedonistic Contessa. But when two bodies turn up in the canal, he realises that art in Venice is a deadly business. And meanwhile, what has happened to Yashim? "The Bellini Card" is a thrilling adventure in which a quest for a lost painting turns into dangerous game of cat and mouse that threatens to destroy the Ottoman throne and overturn the balance of power in Europe.